Ok, so remember we mentioned that Emerald Green has got the honour of being Pantone colour 2013. But let us be honest, Emerald green as gorgeous as it is for clothes and accessories,is a bit too stark to have all around the house. 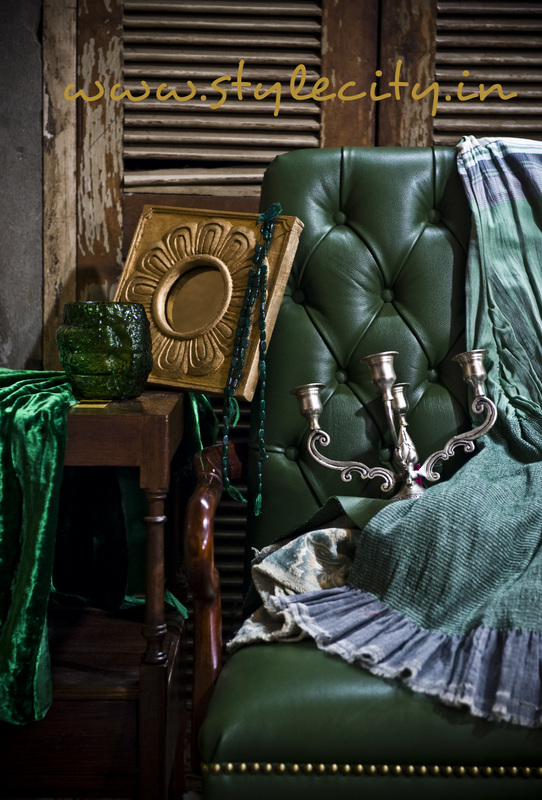 Which is why, a slightly duller shade of emerald is the one we are seeing in Interior decor. As for me, like I said before, Emerald Green over Honeysuckle or Tangerine Tango anyday. Whether it is clothes or interiors the colour green adds a sense of lush and earthy calm, appealing to our sense of well-being, balance and harmony. So do bring in these shades of Green in your wardrobe as well as interiors. P.S- I have already bought myself a pair of Green pants from Promod which I wear everywhere and Green cushions are my latest decor buy, how do you plan to add green to your life? Posted on February 12, 2013 August 20, 2016 by AparnaPosted in Decor, Design, PortfolioTagged Accessories, De Grisogono, decor, design, Diptyque, Emerald, fashion, GoodEarth, green, Lifestyle, Promod, StyleCity, Trend.